Automatic budget cuts set to go into effect this week will slow the already sluggish U.S. economy even further, Federal Reserve Chairman Ben Bernanke warned senators Tuesday. The recovery is already moderate as it is, and upcoming cuts add an additional "significant" burden, Bernanke said in prepared testimony. Forecasts from the Congressional Budget Office suggest that the automatic cuts taking effect Friday will slow the U.S. economy by 0.6 percentage points this year, resulting in the loss of about 750,000 jobs. Bernanke cited those figures in his testimony, a semi-annual report to Congress. "Besides having adverse effects on jobs and incomes, a slower recovery would lead to less actual deficit reduction in the short run for any given set of fiscal actions," he said in prepared testimony. His suggestion? Roll out spending cuts over a longer time frame. "I think an appropriate balance would be to introduce these cuts more gradually, and to compensate with larger, and more sustained cuts in the longer run to address our longer run fiscal issues," Bernanke said. Bernanke has long warned lawmakers that monetary policy, which the Federal Reserve oversees, can only do so much to boost the U.S. economy. It is not a "panacea," he repeated Tuesday. Bernanke urged Congress to consider tax and spending policies "that increase incentives to work and save, encourage investments in workforce skills, advance private capital formation, promote research and development, and provide necessary and productive public infrastructure." "Although economic growth alone cannot eliminate federal budget imbalances, in either the short or longer term, a more rapidly expanding economic pie will ease the difficult choices we face," he said. Bernanke also came to the hearing prepared to defend the Fed's stimulus efforts against its critics. One of them, Sen. Bob Corker, a Republican from Tennessee, accused the Fed of inciting a global currency war and trying to stimulate the economy through a "faux wealth effect." 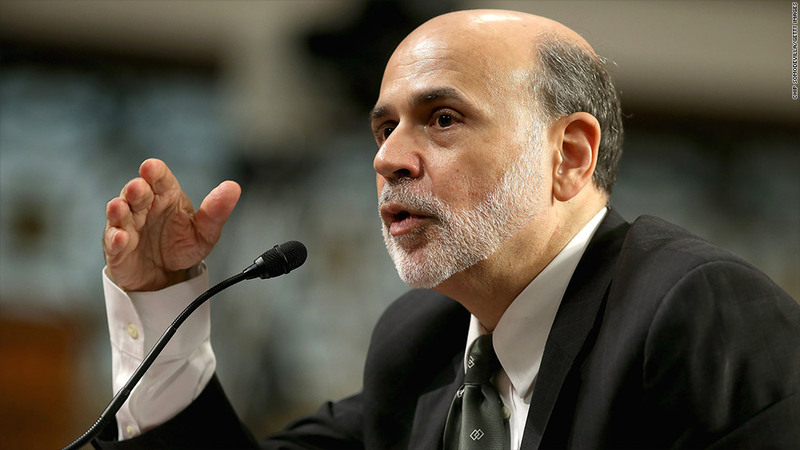 He called Bernanke the "the biggest dove" since World War II. The Fed chairman came back swinging. "We're not engaged in a currency war. We're not targeting our currency." "The point here is not to create what you call a faux wealth effect, the point here is to stimulate the economy and create some forward momentum in growth and employment." "You called me a dove. Well, maybe in some respects I am, but on the other hand, my inflation record is the best of any Federal Reserve chairman in the post-war period." Under more normal circumstances prior to the Great Recession, the Fed typically operated by lowering interest rates to spur economic growth, or vice versa. But with short-term rates already parked near zero, the Fed has turned to alternative policies that include purchasing mortgage-backed securities and long-term Treasury bonds. Those bond purchases are intended to lower interest rates even further. Bernanke said Tuesday that he believes the policy has so far been successful in boosting the housing market and auto sales, which could in turn, lead to more jobs. But many observers wonder if the Fed will be able to pull back the policy when the economy eventually gets going again at a stronger pace. "Does it concern you...how you might have to deleverage the balance sheet? And will that be a challenge to the Fed or could it be?," asked Sen. Richard Shelby, a Republican from Alabama. "We have belts, suspenders -- two pairs of suspenders," Bernanke said. "I think we have the technical means to unwind at the appropriate time; of course picking the exact moment to do, of course, is always difficult." --CNN's Scott Spoerry contributed to this report.